The leather industry in Kenya is mainly dependent on the large livestock resource base of Cattle, Goats, Sheep and Camel. The industry also derives its raw materials from emerging livestock such as fish (Nile perch), farm Ostriches and farm Crocodiles. The sector’s contribution to Kenya’s economy currently stands at Kshs.10.6 billion and creates employment to over 22,540 people directly and indirectly. The hides and skins trade has gone through phases; witnessing positive impact on the sector. The sector transformed from a purely raw material source to relatively modern industry adopting the changing technology and market trends. The transformation saw the country act as a tanning hub for the region through procurement of hides and skins and supply of leather in both local and regional markets. In addition, it experienced exports of semi- processed leather (wet-blue) to the international markets. Currently, tanneries in Kenya have installed capacities standing at 60% for wet-blue, crust leather at 25% and finished leather taking 15%. 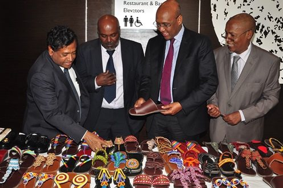 The leather goods and footwear subsectors in Kenya have exhibited a lot of potential for growth with an increase of leather goods units to 85. There are 25 enterprises engaged in formal footwear and leather goods manufacturing. This has a utilization capacity of more than 70%. Apart from the formal sector, there are hundreds of informal footwear manufacturing units/ Small and medium enterprises (SMEs) which undertook manufacturing of 55-60 percent of the local footwear production. To be able to trade externally, one requires a minimum of Kshs 5 million. The Department of Veterinary Services provides technical advice to exporters to help them succeed in export of hides, skins and leather. The Kenya Revenue Authority (KRA) on behalf of the Government levies 80% tax of the Free on Board (FOB) value. On the other hand, the Department of Veterinary Services levies 2% of the FOB to fund the Veterinary Services Development Fund (VSDF). The Veterinary Department levies 1% of the FOB value; KRA does not charge any levy thus encouraging value addition. 0.5% of FOB value is charged by the Veterinary Department which goes to VSDF. KRA does not charge any levy. No levies are charged by both KRA and the Department of Veterinary Services. Note: Taxes and levies by KRA and the Department of Veterinary Services are paid prior to export of goods. The Government plans to roll out Special Economic Zones (SEZs) to boost Kenya’s investment profile. This will replace the current Export Processing Zones (EPZ) and is marked to improve foreign Direct Investments into the country. The focus of the new policy on SEZs is that goods be produced closer to raw material sources and investors handed preferential terms on matters such as licensing. President Uhuru Kenyatta in September signed the Special Economic Zones Act 2015, which spells out key measures to revamp activities in the blocs. The special economic zones law provides incentives for industries to operate in designated zones. The Act provides for numerous tax incentives for investors, including exemption from all existing taxes and duties payable under the Customs and Excise Act, Income Tax Act, East African Community Customs Management Act and Value Added Tax Act on all special economic zone transactions. Enterprises at the SEZs will enjoy several tax incentives under a tightly monitored set-up to avoid losses of government revenue. The preferential tax terms will include value added tax (VAT) exemption on all supplies of goods and services to enterprises, reduction in corporate tax to 10 per cent from 30 per cent for a period of 10 years of operation and 15 per cent for the next 10 years. The government plans to freeze new investments within its Export Processing Zones (EPZ) as it takes up the SEZs model. The SEZs are currently undergoing a pilot program in Mombasa, Lamu and Kisumu. All producers in the leather sector are required to comply with the standards set by the Kenya Bureau of Standards (KEBS) and other relevant International Standards bodies in production of quality leather and leather goods. Manufacturers and business people in the leather sector must comply with the National Environment Management Authority (NEMA) legislation. Outlets: – Yaya and Sarit Centre, Nairobi. Clutch Bags, Cross body bags, hand bags, wallets, purses, travel bags, gifts/corporate items. Murang’a Road, Opposite K.I.E, Aqua Plaza, 3rd Floor, Nairobi. Travel bags and holdalls (briefcases), Satchels, wallets and purses, belts as well as handbags and bespoke items in exotic leather. Tembo Road, Karen – Nairobi. Hand bags, wallets and purses. Outlet: Yaya Centre, Nairobi.